The hfq gene is conserved in a wide variety of bacteria and Hfq is involved in many cellular functions such as stress responses and the regulation of gene expression. It has also been reported that Hfq is involved in bacterial pathogenicity. 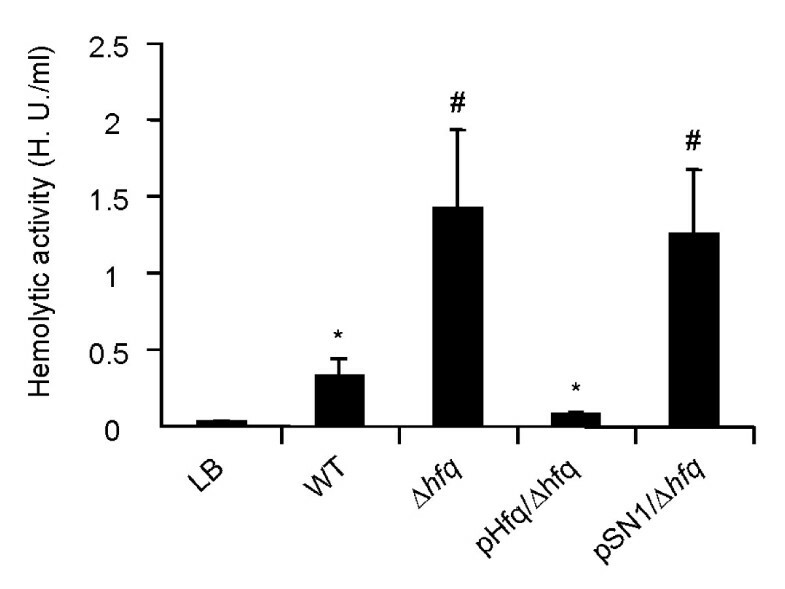 However, it is not clear whether Hfq regulates virulence in Vibrio parahaemolyticus. To evaluate this, we investigated the effect of Hfq on the expression of virulence-associated genes including thermostable direct hemolysin (TDH), which is considered to be an important virulence factor in V. parahaemolyticus, using an hfq deletion mutant. The production of TDH in the hfq deletion mutant was much higher than in the parental strain. Quantification of tdh promoter activity and mRNA demonstrated that transcription of the tdh gene was up-regulated in the mutant strain. The hfq-complemented strain had a normal (parental) amount of tdh expression. The transcriptional activity of tdhA was particularly increased in the mutant strain. These results indicate that Hfq is closely associated with the expression level of the tdh gene. Interestingly, other genes involved in the pathogenicity of V. parahaemolyticus, such as VP1680, vopC, and vopT, were also up-regulated in the mutant strain. Hfq regulates the expression of virulence-associated factors such as TDH and may be involved in the pathogenicity of V. parahaemolyticus. Vibrio parahaemolyticus is a major causative agent of gastroenteritis, and is often associated with the consumption of raw or undercooked shellfish. In addition to gastroenteritis, this organism causes clinical manifestations such as wound infections and septicemia [1–3]. Most clinical isolates of V. parahaemolyticus exhibit β-type hemolysis on a special blood agar medium, whereas environmental isolates do not. This hemolysis is called the Kanagawa phenomenon (KP) and is considered to be a reliable marker for detection and identification of pathogenic strains . It has been reported that thermostable direct hemolysin (TDH) specifically contributes to the KP . Previous studies have shown that TDH shows several biological activities such as hemolysis, cell cytotoxicity and enterotoxicity [5–7]. Furthermore, molecular epidemiological studies have indicated that the tdh gene is strongly associated with clinical strains . Therefore, TDH is thought to be an important virulence factor in V. parahaemolyticus. Although the genetic structures of the tdh gene and its neighboring regions are known, there is little information as to how tdh gene expression is controlled by other factors in this organism. The hfq gene is conserved in a wide range of bacteria, but Hfq varies in the number of amino acids between different bacteria . Hfq is a global regulator that modulates the stability and translation of mRNAs. It is thought that Hfq acts as an RNA chaperone by mediating interactions between many small regulatory RNAs and their mRNA targets . It has been shown that Hfq regulates the expression of many genes, including the genes encoding for stationary-phase sigma factor (rpoS) and outer membrane protein A (ompA) [10–12]. It has also been shown that Hfq contributes to pathogenicity in bacteria such as Brucella abortus, Listeria monocytogenes, Pseudomonas aeruginosa, Salmonella typhimurium, V. cholerae, and Yersinia enterocolitica [13–18]. Although Hfq is associated with bacterial virulence, it is not clear whether Hfq is associated with pathogenicity in V. parahaemolyticus. In this study, we have attempted to elucidate the correlation between Hfq and V. parahaemolyticus pathogenicity, particularly with regard to the important virulence factor TDH, using an hfq gene-deletion mutant. The complete genome of V. parahaemolyticus strain RIMD2210633 has been sequenced, and the hfq gene is located on chromosome 1 (GenBank: BA000031) . The gene structures neighboring hfq in V. parahaemolyticus are identical to those of V. cholerae and Escherichia coli (Fig. 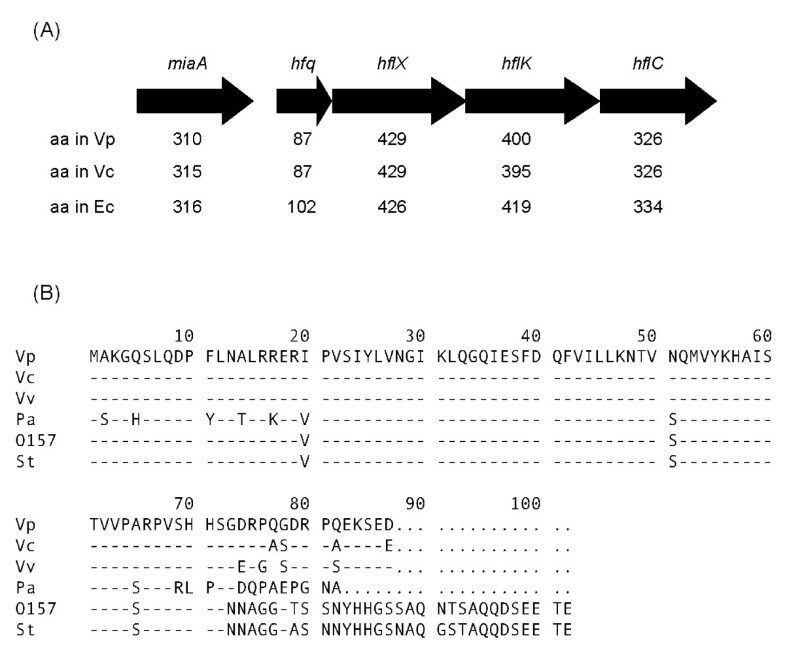 1A) , and the Hfq amino acid sequence of V. parahaemolyticus is highly conserved with that of V. cholerae (Fig. 1B). Genetic structure and sequence alignment of Hfq. (A) Genetic structure of hfq and neighboring regions. Vp, V. parahaemolyticus strain RIMD2210633 (accession no. BA000032); Vc, V. cholerae (accession no. NP_230001); Ec, E. coli serotype O157:H7 (accession no. NP_313175). Arrows indicate the direction of transcription. The numbers of amino acids (aa) that comprise the proteins are indicated. (B) Sequence alignment of Hfq from various pathogens. Dashes indicate amino acid residues that are identical to those in V. parahaemolyticus. All Hfq amino acid sequences were obtained from GenBank. Vp, V. parahaemolyticus strain RIMD2210633 (accession no. BA000032); Vc, V. cholerae (accession no. NP_230001); Vv, V. vulnificus (accession no. NP_760222); Pa, P. aeruginosa (accession no. NP_233631); O157, E. coli serotype O157:H7 (accession no. NP_313175); St, S. typhi (accession no. NP_458797). Previous studies showed that defects in the hfq gene decreased the growth rates of E. coli and P. aeruginosa, but not of S. typhimurium and V. cholerae [11, 14, 15, 20]. In LB medium supplemented with 3% NaCl, Δhfq, a derivative of the V. parahaemolyticus strain RIMD2210633 with an in-frame deletion of 85 of the 87 amino acid residues of Hfq, showed a reduced growth rate as compared with that of the parental strain (Fig. 2). This indicates that Hfq has an effect on the growth of V. parahaemolyticus. Growth of the Δ hfq strain in LB medium. Bacteria were cultured in LB medium supplemented with 3% NaCl at 37°C and the cell density was measured with a spectrophotometer. The assay was performed independently 3 times. Closed circle, parental strain; closed square, hfq-complemented deletion strain (pHfqΔhfq); open circle, hfq deletion strain (Δhfq); open square, hfq deletion strain with empty vector (pSN1Δhfq). Hfq regulates the bacterial pathogenicity that is mediated by alterations in virulence gene expression [13–18]. Therefore, we investigated the hemolytic activity of the Δhfq strain by determining the level of TDH in culture supernatants, because TDH is thought to be important for V. parahaemolyticus pathogenicity. In the following experiments, we evaluated all of the strains under the same growth phase conditions. The relative hemolytic activity in the culture supernatant of the Δhfq strain was significantly higher than that of the parental strain. We introduced pHfq, which harbors the hfq gene, into Δhfq and showed that the relative hemolytic activity in the culture supernatant of pHfq/Δhfq was lower than that of Δhfq. The hemolytic activity in the culture supernatant of pSN1/Δhfq, in which an empty vector was introduced into Δhfq, was almost the same as that of Δhfq (Fig. 3). These results suggest that Hfq is associated with the production of TDH in V. parahaemolyticus. Hemolytic activity in culture supernatants of parental and derivative strains. Bacteria were cultured in 10 ml of LB medium supplemented with 3% NaCl at 37°C. One hemolytic unit (HU) was defined as in a previous report [45, 46]. The results are expressed as means ± SDs of 5 independent experiments. *, p < 0.05 versus LB; #, p < 0.01 versus WT. LB, negative control; WT, V. parahaemolyticus strain RIMD2210633 (parent strain); Δhfq, hfq deletion strain; pHfq/Δhfq, hfq-complemented deletion strain; pSN1/Δhfq, deletion strain with empty vector. We next investigated the level of TDH by Western blotting, and found that the expression of TDH was increased at mid-log growth phase (OD600 = 0.6) as compared with the parental strain (Fig. 4A). The amount of TDH in the Δhfq strain at stationary growth phase was also higher than that of the parent strain (Fig. 4A). The elevation in TDH production was fully reversed by trans-complementation with the hfq gene in pHfq/Δhfq (Fig. 4B). These results suggest that TDH production is specifically associated with Hfq. We also examined the mRNA levels of the tdh gene at mid-log growth phase using quantitative real-time RT-PCR. The amount of tdh mRNA in the Δhfq strain was significantly higher than in the parent strain (Fig. 4C). These results suggest that the elevation of hemolytic activity in the Δhfq strain is due to activation of tdh gene transcription. Production of TDH by the Δ hfq strain. (A) Detection of TDH in cell lysates from mid-log phase (OD600 = 0.6) and stationary phase (OD600 = 1.5) cultures. (B) Detection of TDH in mid-log phase cell lysates from the parent strain and derivatives. (C) Quantification of tdh mRNA. Fold change in the gene transcription level from mid-log phase in the Δhfq strain versus the parent strain, as measured by quantitative real-time RT-PCR. Data analysis was as previously described [42, 43]. Data are expressed as means ± SDs of 5 independent experiments. *, p < 0.05. Previous studies showed that while two tdh genes (tdhA and tdhS) are located on chromosome 2 of strain RIMD2210633, in this strain TDH production was attributed only to tdhA [15, 18]. Although we found that TDH was elevated significantly at both the transcriptional and translational levels in the Δhfq strain, quantitative real-time RT-PCR and Western blotting using anti-TDH antibody cannot distinguish between the two tdh genes, since their nucleotide sequences are very similar (97% identity). To solve this problem, transcriptional fusions of tdhA and tdhS to the lacZ reporter gene (pHN1 and pHN2, respectively; Table 1) were constructed and were monitored in Δhfq or in the isogenic parental strains. In the parental strain, the relative activity of the tdhA-lacZ fusion gene was much higher than the tdhS-lacZ fusion gene (Fig. 5). This result is consistent with previous reports [21, 22]. Interestingly, the relative activity of the tdhA-lacZ fusion gene in the Δhfq strain was significantly elevated when compared with the parental strain, whereas there was no difference in the activity of the tdhS-lacZ fusion gene between the parental and Δhfq strains (Fig. 5). These results indicate that the elevation of tdh mRNA levels in the Δhfq strain is due to tdhA gene transcription. Activities of the tdhA and tdhS gene promoters in the WT and Δ hfq strains. β-galactosidase activity measured in the parental WT strain (black bars) and the Δhfq strain (open bars). 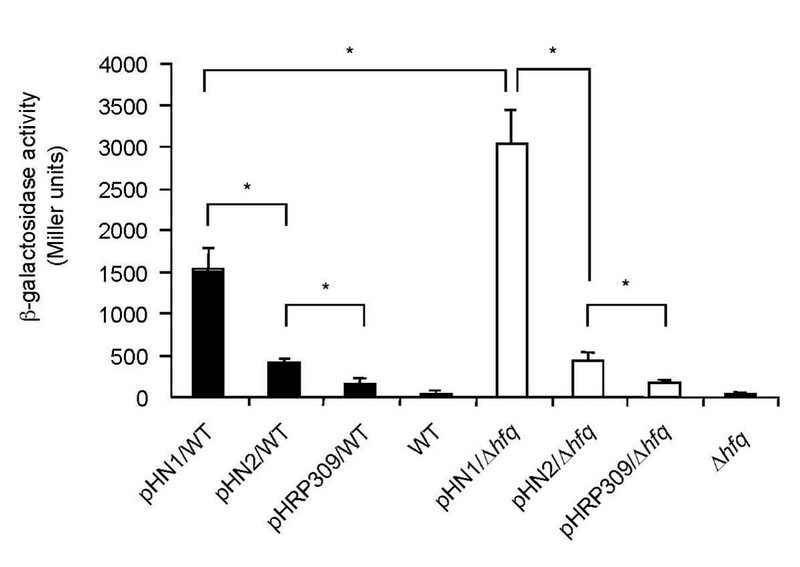 pHN1/WT, pHN1 harboring tdhA gene promoter in V. parahaemolyticus strain RIMD2210633; pHN2/WT, pHN2 harboring tdhS gene promoter in V. parahaemolyticus strain RIMD2210633; pHRP309/WT, pHRP309 in V. parahaemolyticus strain RIMD2210633; pHN1/Δhfq, pHN1 harboring tdhA gene promoter in Δhfq strain; pHN2/Δhfq, pHN2 harboring tdhS gene promoter in Δhfq strain; pHRP309/Δhfq, pHRP309 in Δhfq strain. Data in Miller units are the means ± SDs of 5 independent experiments. *, P <0.01. Recently, it has been shown that type III secretion systems (TTSS1 and TTSS2) in V. parahaemolyticus are also important for the pathogenicity of this organism . To evaluate whether Hfq can regulate the expression of TTSS genes as well as tdh, we investigated the expression of three genes (VP1680, vopC, and vopT), which encode TTSS effector proteins [24, 25], at the transcriptional and translational levels in the Δhfq strain. VP1680, which is secreted via TTSS1, showed elevated gene expression in the Δhfq strain. The expression of vopC and vopT, which are secreted via TTSS2, was also increased in the Δhfq strain (Fig. 6). These results indicate that the transcription of some genes encoding TTSS effector proteins is regulated in an Hfq-dependent manner. Expression of virulence-associated genes in the Δ hfq strain. (A) Western blot detection of proteins in total cell lysates. (B) Quantification of mRNAs encoding virulence-associated proteins. The fold changes in gene transcription levels in the Δhfq and parental WT strains grown to mid-log phase were determined by quantitative real-time RT-PCR. Data analysis was as previously described [42, 43]. Data are the means ± SDs of 5 independent experiments. *, p < 0.05. Hfq plays a role as a major post-transcriptional regulator in numerous bacterial pathways . Previous studies have shown that Hfq affects the virulence of various pathogenic bacteria [13–18]. In this study, we have demonstrated that Hfq plays a critical role in the expression of TDH (Fig. 4). This indicates that Hfq is involved in the virulence of V. parahaemolyticus just as in other pathogenic bacteria, because TDH is considered to be an important virulence factor in V. parahaemolyticus [5–8]. The modulation of bacterial pathogenicity by Hfq has been associated with small non-coding RNAs [26–29]. It has been shown that deletion of the hfq gene in P. aeruginosa affects the expression of virulence genes by changing the stability of a small non-coding RNA . Recently, Lenz et al. have speculated that small non-coding RNAs exist in the V. parahaemolyticus genome . Although there is little information regarding small non-coding RNAs in V. parahaemolyticus, we speculate that one or more small non-coding RNAs interacting with tdh may regulate virulence gene expression levels. The production of TDH is reportedly affected by environmental factors such as pH, temperature, and chemicals [30–34], but little is known about the modulation of expression of the tdh gene by internal factors in V. parahaemolyticus. In this study, we showed that Hfq in V. parahaemolyticus was important for the expression of the tdh gene and that the transcription of the tdhA gene rather than the tdhS gene was regulated by Hfq (Figs. 4 and 5). This result indicates that the expression of the tdh gene is under the control of Hfq. Lin et al. have reported that ToxR in V. parahaemolyticus is associated with the production of TDH . We investigated the transcriptional activity of toxR in the Δhfq strain under our experimental conditions, but could not find any differences between the Δhfq and wild type strains (data not shown). 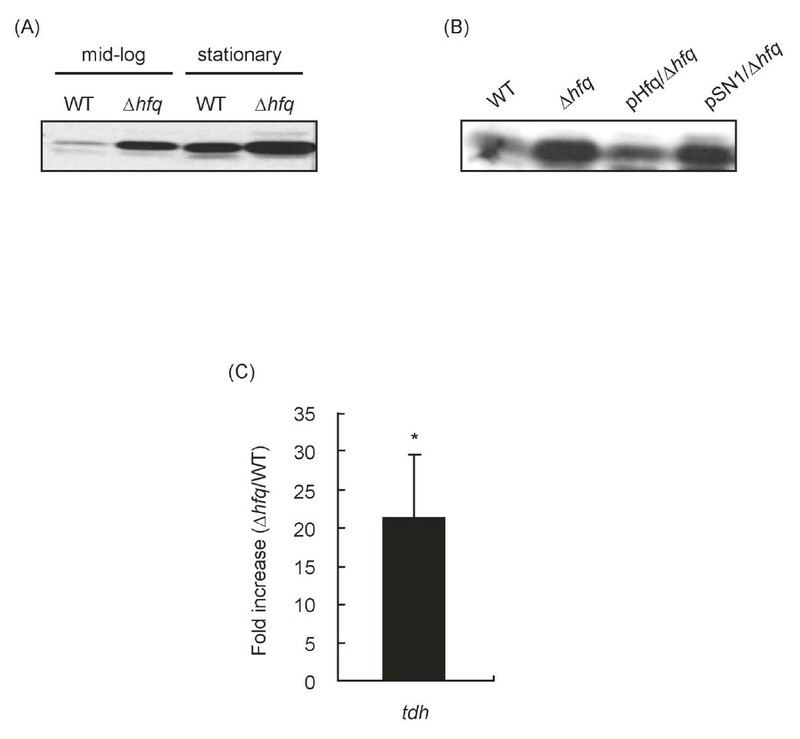 This suggests that the regulation of tdh gene expression by Hfq is toxR-independent. We are currently examining how Hfq regulates the expression of tdh. Proteome and microarray analyses in various bacteria have shown that Hfq controls the expression of various genes [14, 16, 26]. Thus, Hfq is considered to be a global regulator of gene expression including genes encoding virulence factors. 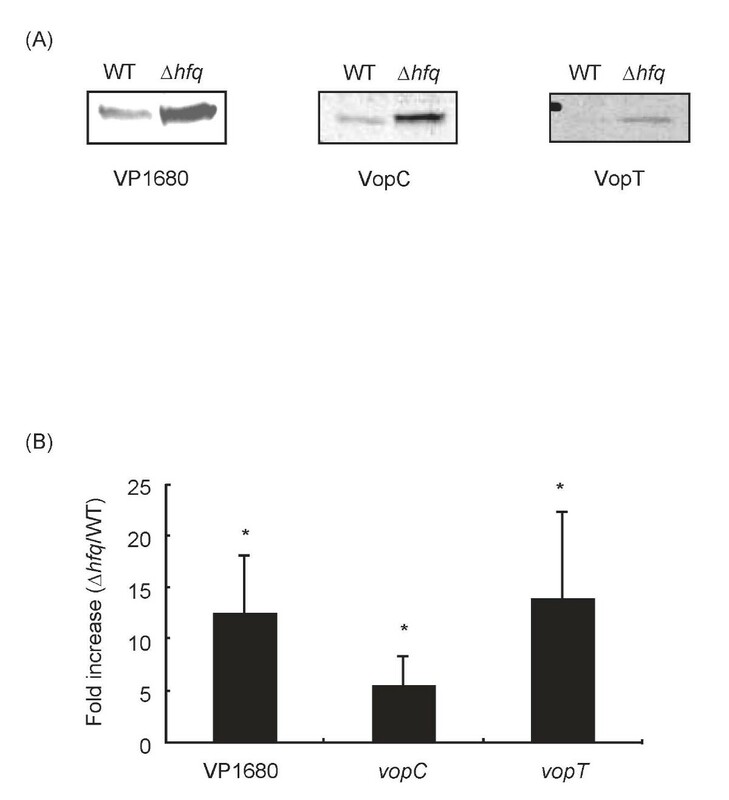 In this study, we confirmed that Hfq also regulates the expression of at least three effector proteins of TTSSs, namely VP1680, VopC and VopT, in V. parahaemolyticus (Fig. 6). It has been shown that TTSSs and these three effector proteins contribute to pathogenicity in V. parahaemolyticus [23–25]. Although TTSSs in pathogenic E. coli and Salmonella are involved in the regulatory mechanisms for the expression of TTSS-related genes [36, 37], this is not yet clear in V. parahaemolyticus. Moreover, it seems likely that other novel effector proteins will be found that contribute to the pathogenicity of V. parahaemolyticus [25, 38]. Our results suggest that Hfq may be important for the pathogenicity of V. parahaemolyticus. Experiments are currently underway to analyze the mechanisms by which Hfq governs the expression of virulence genes in V. parahaemolyticus. We have confirmed that the expression of TDH in V. parahaemolyticus is closely associated with the transcriptional activity of tdhA. Hfq regulates the transcriptional activity of tdhA and the expression of TDH in V. parahaemolyticus. We predict that Hfq may be a global regulator of pathogenicity in V. parahaemolyticus. The bacteria and plasmids used in this study are listed in Table 1. V. parahaemolyticus strain RIMD2210633 was used as the standard strain in this study . E. coli and V. parahaemolyticus strains were routinely cultured in Luria-Bertani (LB) medium and LB medium supplemented with 3% NaCl, respectively. The mutant strain was constructed by homologous recombination [23, 39]. In brief, a DNA fragment was generated by PCR using primers hfq-1 (5'-GGATCCAGCCGATAACATTGAGCAGGC-3') and hfq-4 (5'-CTGCAGTCAGCACCAGTCAAATGTAC-3') after the preparation of PCR products using primers hfq-1 and hfq-2 (5'-CTCGATGAAGAATTAAGCCATTTTATTTTC-3'), and hfq-3 (5'-GAAAATAAAATGGCTTAATTCTTCATCGAG-3') and hfq-4. The amplified PCR product was cloned into the suicide vector pYAK1  and the resulting plasmid was transformed into E. coli strain SM10 λpir. Bacterial conjugation was performed with the recombinant E coli strain SM10 λpir and V. parahaemolyticus. Colonies were confirmed to have the gene deletion by PCR using the primers hfq-1 and hfq-4 and by Southern blotting. Bacterial strains harboring the hfq gene were constructed as previously described . Since the hfq gene promoter of V. parahaemolyticus has not been identified, the tdhA gene promoter was used for expressing hfq . The hfq gene was amplified by PCR using primers hfq-5 (5'-GGATCCATGGCTAAGGGGCAATCT-3') and hfq-6 (5'-GAATTCTTAATCTTCTGATTTCTC-3'), and the PCR-generated hfq gene and tdhA promoter were cloned into pSA19CP-MCS to construct pHfq . The constructed plasmid was introduced into the V. parahaemolyticus deletion mutant by electroporation . Preparation of total RNA from V. parahaemolyticus was carried out previously . Quantitative real-time RT-PCR and data analysis were performed as previously described [42, 43]. The oligonucleotide primers for rrs, tdh, vopC (= vpa1321), and vopT (= vpa1327) were as previously described . The oligonucleotide primers for VP1680 were as follows: 5'-CACACTTGGTATGGCGACAG-3' and 5'-TGAGTTGGTCTTGCACTTCG-3'. The oligonucleotide primers were designed using the genome sequence of V. parahaemolyticus strain RIMD2210633 . Antibody against TDH was prepared as described previously . Antibodies against VP1680, VopC, and VopT were prepared according to a previous report . In brief, DNAs encoding VP1680, vopC, and vopT were generated by PCR using the following oligonucleotide primers: for VP1680, 5'-GGATCCATGGTGAATACAACGCAAAA-3' and 5'-GAATTCTTAAATCCAGCCTTCGGCT-3'; for vopC, 5'-GGATCCATGCCAATATTAAATATTAG-3' and 5'-GAATTCTTAACCATTTTTCAATAGCA-3'; for vopT, 5'-GGATCCGTGAAGGTTTGTAGAATACA-3' and 5'-GAATTCTCACTTAGCTAAATCTAGCG-3'. The resulting DNAs were cloned into pET30a. Recombinant proteins were expressed in E. coli BL21(DE3) and purified using His-tag affinity resins and buffer kits according to the manufacturers' instructions (Merck, Darmstadt, German). Polyclonal antibodies were generated by immunizing female New Zealand White rabbits as previously described . V. parahaemolyticus was cultured in LB medium supplemented with 3% NaCl. Cells (2 ml of culture) were collected by centrifugation and washed once with phosphate-buffered saline (PBS; pH 7.4). The pellets were resuspended in PBS and 10 μg of total cell lysates were used for Western blotting. After electrophoresis, proteins were transferred to membranes and probed with each of the primary antibodies. The secondary antibody was anti-rabbit IgG conjugated to horseradish peroxidase (Bioscience, Camarillo, CA, USA). Signals were detected using an ECL Western blotting kit according to the manufacturer's instructions (GE Healthcare Bio-Science, Piscataway, NJ, USA). Bacterial cells were prepared by diluting overnight cultures 1:1000 into fresh LB medium supplemented with 3% NaCl and incubating at 37°C for 24 h with shaking. After the elimination of bacterial cells from culture supernatants by centrifugation and a syringe filter, the supernatants were concentrated using an Amicon Ultra-15 centrifugal filter (Millipore, Billerica, MA, USA). Protein concentrations were determined using a BCA protein assay kit (Thermo Scientific, Rockford, IL, USA). Hemolytic activity was assayed according to a previously described method [45, 46] with rabbit red blood cells (rRBC) (Nippon Bio-Test Laboratories, Tokyo, Japan). 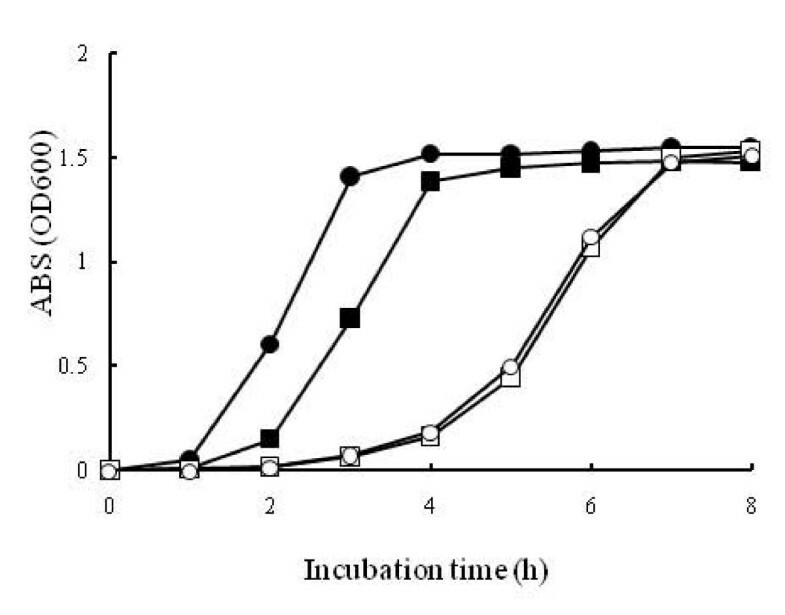 Protein (20 μg) was incubated with rRBC at 37°C for 6 h.
β-galactosidase assays were performed as described previously . In brief, the tdhA and tdhS promoter regions were generated by PCR using the oligonucleotide primers tdhA-1 (5'-GTCGACAATTCACGACGAATCGGAG-3') and tdhA-2 (5'-GAATTCATATCGGTACTTCATAAA-3'), and tdhS-1 (5'-GTCGACAGCTTACAGCTTGGTATGCC-3') and tdhS-2 (5'-GAATTCGTGTTTCATAAAAAACCCAT-3'), respectively. The products were cloned into pHRP309 . The constructed plasmids were introduced into V. parahaemolyticus strains by electroporation . For this assay, bacteria were cultured in LB medium supplemented with 3% NaCl until early-log phase (OD600 = 0.2). The β-galactosidase activities of the strains were determined as described previously . All data are expressed as means ± standard deviations. Statistical significance was calculated by paired and unpaired t-tests. In all cases, a p-value of < 0.05 was considered significant. This work was supported by a Grant-in-Aid for the 21st Century Center of Excellent Program, Human Nutritional Science on Stress Control, The University of Tokushima. MN, AT, and ZS performed the experiments and drafted the manuscript. NH and KM participated in the discussions of the study design and provided technical support. YN conceived of the study and drafted the manuscript. All authors have read and approved the final manuscript.